There are thousands of magazine issues published every month. We came across many of them and found some of them are genuinely good and worth your money and most importantly the time you need to spend for it. 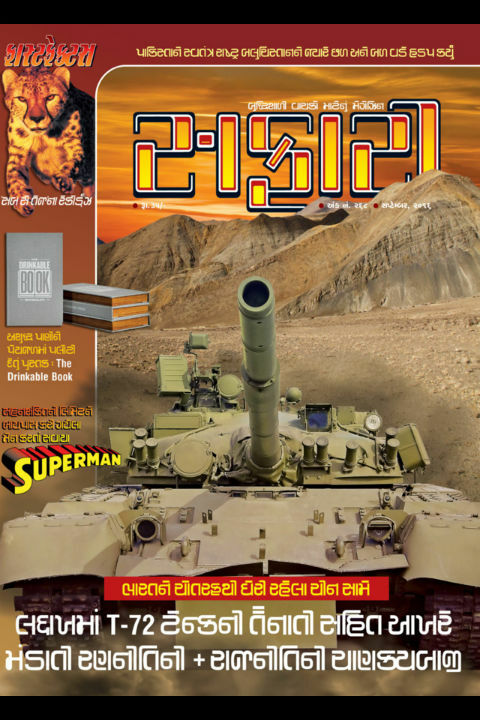 Safari – a science and knowledge magazine from India – is one such magazine. Though it’s English edition couldn’t survive, it’s Gujarati edition prints on regular schedule. Here are our personal views and reviews for the September 2016 issue of the same. It is worth to note that we have read the digital edition of the issue on Magzter app. The editorial of any print media gives us a look at the vision of the editor not only about the content of the same, but often on current affairs. The editorial of this issue talks about recently happened – leak of data about Scorpene submarine. The views of the editor are one of the wisest take on the incident we have read in recent days. We are living in 21st century but still availability of pure or clean water to drink is a luxury for many souls. It is definitely most worrysome thing for the mankind. If we cannot have pure air the breathe, pure water to drink for everone, then how can we say we have moved advance? Anyway some people may not consider this as a subject to talk about (like sanitation), while some do discussion on it in board rooms (drinking mineral/purified water) and some from the comfort of their drawing rooms. However there are some humans who are gem at the heart and does something stuff to solve this problem. Result of one such mission is The Drinkable Book. There is a fantastic article about it in this issue which is a good read. Here are some quick links to follow, if you want more information on – The Drinkable Book. http://pagedrinkingpaper.com (Link not working as of now). When we are blessed with so much abilities and skills, which can be stretched to something look miraculous, by the nature; there are boundaries also. For example we cannot store more than a certain amount of air in our lungs, or we cannot run beyond a specific distance. However, in the quest of survival of the fittest, we are given some special abilities according to the environment and situations in which we live. They are known for their ability to run for many kilometers, and that also not on the straight walkaways. Their running style is analysed by various experts to know the best way to run. While it is very tough to hold breathe for a minute underwater. Some can extend it to a couple of minutes. It is a well known fact that in order to hold your breathing for maximum time, you need to limit your activities (so oxygen is not needed towards that). However the Sama Bajau People, who are also known as Sea Gypsies of Indonesia dives underwater for hunting. They perform their hunting without any Oxygen tank! Here is the National Geographic link exploring the facts. Often compared to dolphins, the Moken People does hunting underwater with open eyes. See this video to believe their abilities. And, this is not it, the article contains much more information to go for. Highly recommended read. The fast facts segment of the issue talks about various speed records and its a light read. Recently, with the political master stroke of Indian government, the talks about Balochistan are taking headlines all around the world. There is a very detailed article in the magazine about the roots of the issue. It gives you “all you need to know” information about Balochistan, and the troubles (and the roots of the trouble) the innocent brave people of Balochistan are facing. We are not talking much about the content here to avoid spoilers. The author remains unbiased throughout the article. It is written in fantastic manner. This article is definitely the heart of the magazine issue. In another political move, India have stationed it’s T-70 tanks in Ladakh. It is very important and much needed move indeed. Answering a question by many readers about it, the author gives all the details and also explores the background (or the chain of incidents) which lead to this step. It is very rare to find unbiased views on national issues and things happening around it. Some shy away to talk about it, some fear talking about it and many don’t find it interesting to woo readers; because most of the magazine focus more on selling. Safari does courageous things in this arena. It is thus falling in “must read” segment for those who seeks real news and proper knowledge. In addition to these, there are regular sections like puzzles, Q/A and other which are also worth to go for. A magazine issue which is definitely worth the time and money you spend for it. There are a very few magazines found in the market which live up to the expectations.